It has been such a long time since I have written an Art related post. Art Class is a segment of my blog where I attempt to expand my art education by visiting exhibitions and galleries around the world. This time however, it is a bit of a flashback. At the moment I am currently preparing a presentation on the Taipei Fine Arts Museum for University so it inspired me to create this post. The Taipei Fine Arts Museum is located in the Zhongshan district of Taipei at Yuanshan (Yuanshan圓山站 MRT station on the red line.) It was the first purpose built contemporary art gallery of its kind in Taipei and was one of my favourite hangouts when I lived in Taiwan. The Taipei Fine Arts Museum has a really interesting background from it's inception in 1983 until now it has been promoted as the heart of the Taiwanese art scene by the government of Taiwan. The museum have also been responsible for curating Taiwan's entries for the Venice Biennale, which was reduced to institutional participation to stop conflict with the People's Republic of China. There were also a large number of scandals which took place in the 1980's regarding the frequent clashes between the directors and the artists. One, Su Ruiping, actually stomped on an artists work and destroyed it because she didn't think it fit the aesthetic of the museum and it wasn't contemporary enough as it included elements from temples. The artist in question, Zhang Jianfu was livid and tried to sue her, thus ruining his career in the process. In another case, she had an artist's work painted silver without his permission because she felt that the red colour of his sculpture represented communist sentiments. The famous artist Lee Ming Sheng was even arrested because he wanted to create a piece of performance art without realising the date of his exhibition was 28th Feb - a date imprinted in the minds of the Taiwanese because it marks the anniversary of a massacre which took place in 1947 when an anti-government uprising was violently quelled by the KMT -led government. During the late 80's it was still a taboo subject and Lee Ming Sheng was mistaken as making a political statement when in actuality the significance of the date had not really crossed his mind. There seemed to be a complete dichotomy between the will of the artists, and the will of the fine arts museum as an institution, implementing what they deem to be acceptable artwork. Studying the history of the Fine Arts museum for a course I'm currently taking was really surprising because I always considered art in Taiwan to be very liberal, very inclusive and very free. I found it to be at odds with what I read about the TFAM. 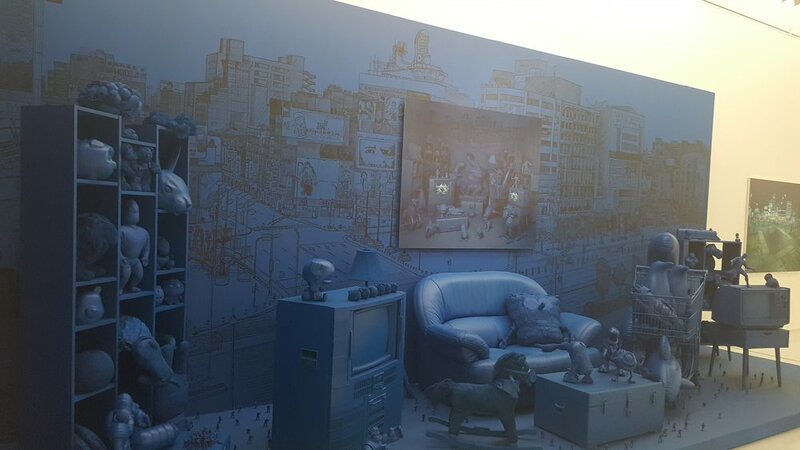 However, the TFAM hosts a biennale showcasing the works of many Taiwanese and International artists and is co-curated by an international guest. Originally the museum focused on exhibitions by artists from the R.O.C and that carried Taiwanese passports. I loved visited TFAM for the unique exhibitions and the permanent art work on the 3rd floor. The building itself is based on Japanese metabolist movements and is well designed. Since it's creation, now there are galleries all over Taiwan, the contemporary arts museum by Zhong shan in Taipei, in Kaohsiung , Taichung, you name it. There are also many independent artist groups who showcase in smaller and more unknown locations. Art literally drips from every corner in Taiwan. And still, if I had a free day, I found myself getting the subway down to Yuanshan and wandering around the long hallways of this building and staring at the art inside. It was truly one of my favourite spots in Taipei and I recommend everyone to check it out if they ever visit.